Designed to measure whether the metal enclosure of electrical equipment is connected to the ground terminal at sufficiently low resistance levels. It also can be used to evaluate the grounding conditions of large-scale electrical installations. Measurement is carried out by using a high current according to the specifications of the measurement object, and determining the voltage drop at the measurement point. Reference values are as set out in the various safety standards. The 3157-01 can carry out measurements in accordance with the stipulations of multiple standards. 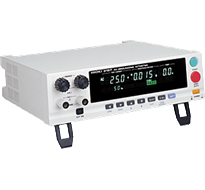 HIOKI 3157-01 AC Grounding HiTester is an AC ground bond tester designed for protection circuit testing of a wide range of electrical equipment, including industrial machinery, medical equipment, and measuring instruments using a constant current system, enabling it to provide stable output current.